Excitement does not describe the squeals I heard as I opened the box that came from Kidorable. 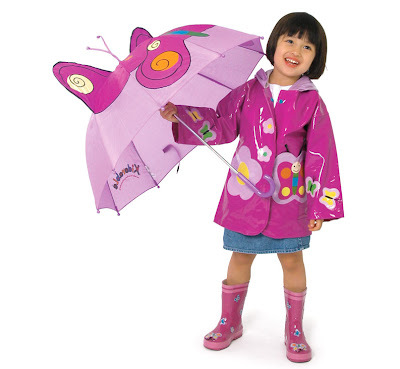 I have mentioned before that Sadie is a girly girl and loves all things girl, dressing up, princess and make believe, so you can imagine her face as we unwrapped the Butterfly raincoat, rain boots and umbrella. The two days that we were stuck in the house due to the recent storm she wore her new rain gear all day because it was “raining” outside and very “burry.” As a mom’s view on the rain gear it is incredible and completely “kidorable.” I have never met a kid that didn’t like an umbrella.